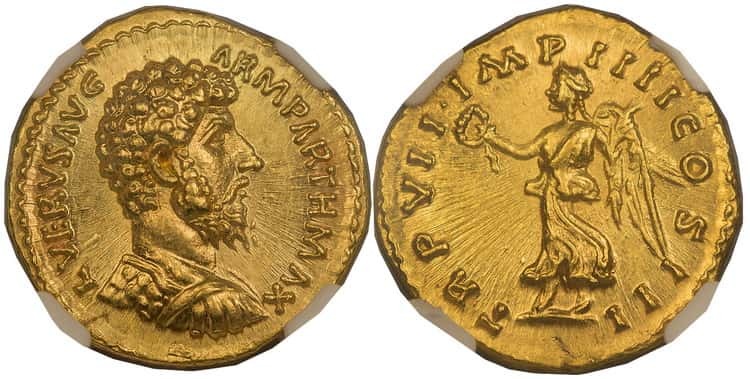 The Aureus of the Roman Empire, or simply the Auras, is the golden coin of ancient Rome, and its name in Latin means “gold”. 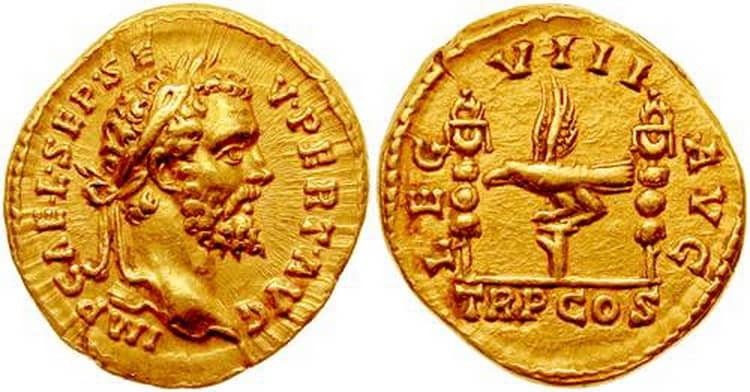 For the first time, the Aureus began minting during the Second Punic War and used as encouragement and reward to soldiers for military merit. These Roman coins were in circulation for no less than five centuries and during this time they were subjected to repeated devaluations. 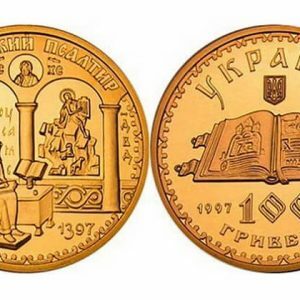 So, for example, after the next devaluation of the emperor Constantine, the solidarity of the Aureus came from the solidarity of the Roman Empire. 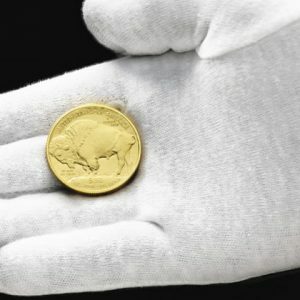 Gold aureus are of high historical value, therefore they are exclusively collectible coins and have a high cost. 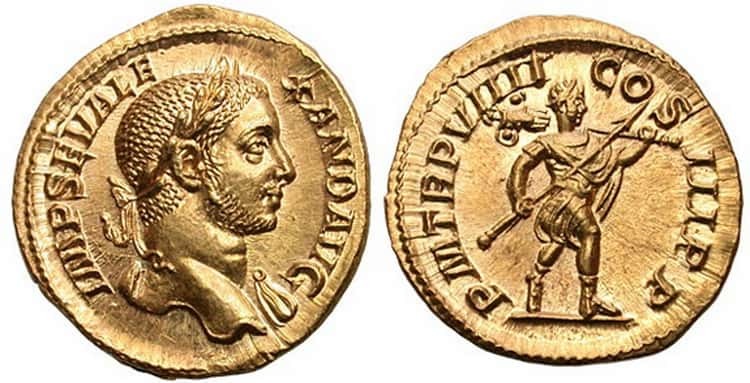 Few inhabitants of the Roman Empire knew their ruler by sight, so they began to coin portraits of ruling emperors on coins, distinguishing them from ordinary people with signs of royal regalia. One of these was a wreath of laurel, which in ancient Greece was a symbol of victory. On the reverse of coins, as a rule, mythological Roman gods were depicted with symbols of power, peace, fertility, power and justice. Emperor Alexander Severus (full name Caesar Marcus Aurelius Severus Alexander Augustus) reigned from 222 to 235 AD. Legionnaires killed him together with his mother, Julia Mammea, and the family of Severus was destroyed. During his rule the gold and silver coins of the Roman Empire were represented not only by aureus, but also by quinarii, denarii, sestertii, dupondius, and assies. 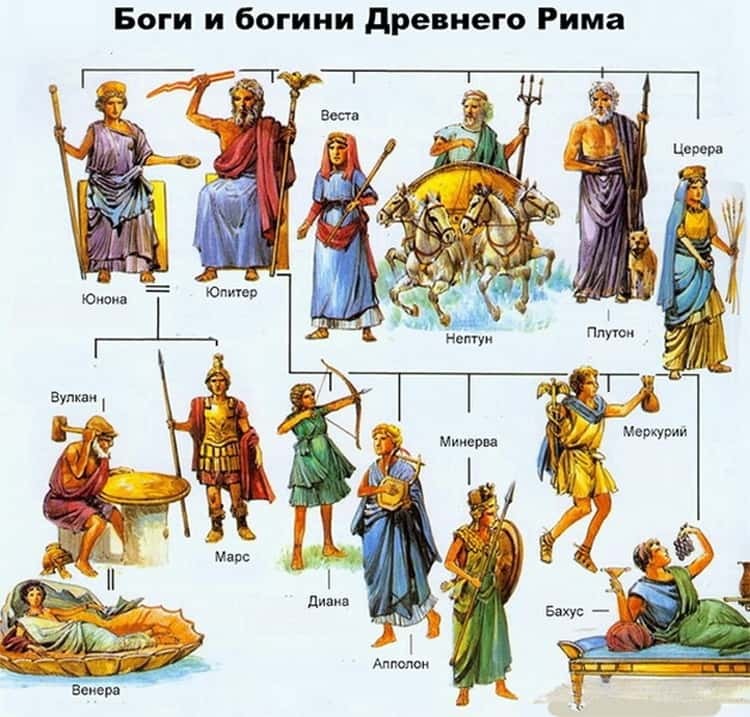 It goes without saying that in parallel, aurei were minted with the names of his mother and wife − Barbia Orbiana. On the aureus of Alexander Sever, Pax was depicted as the mythological goddess of prosperity and peace. It is usually depicted with a cornucopia, caduceus or kerikion (Hermes rod), wheat ears and an olive branch. They minted this image on other coins of the Roman Empire. The Roman emperor, Hadrian, whose love for the Greeks earned him the nickname “Greek” (Graeculus), was an honorary citizen of Athens. The Athenians knew about the contribution of Hadrian to the development and formation of Greece, therefore they supported and worshiped him. 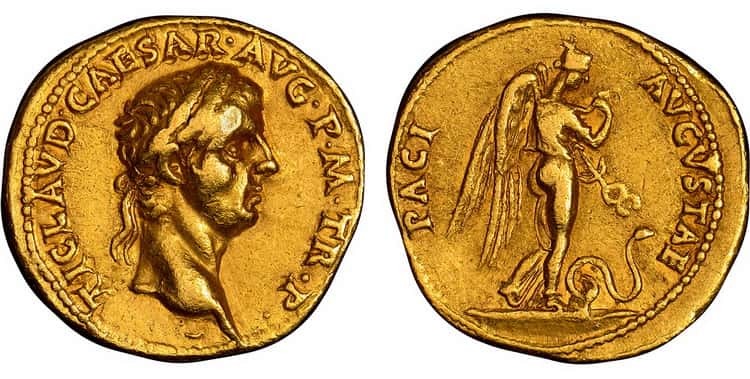 The golden aureus, issued by Adrian, reflected this his love for Greece and were the most revered coins. Even during the reign of Emperor Septimius, in addition to the mint, there were also so-called “eastern” mints in Rome, which were distinguished by a very low quality of coin minting. The mint in Latakia, which began its work during the Persian military campaign and existed between 197 and 202, is no less famous. This courtyard minted coins with portraits of all members of the imperial family. 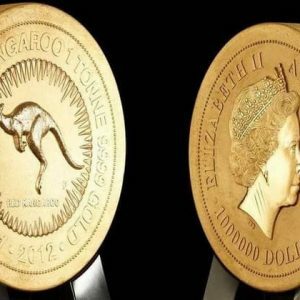 It is worth noting that the quality of Latakian coins in comparison with coins of other mints is not very high, and the portraits of the emperor and members of the imperial family are made in the popular print manner, more caricatured than reliably. The coins of the Alexandrian Mint during the reign of the Emperor of the North have their own unique design with a more elongated portrait image and the same elongated letters and numbers. Here also minted and coins for Julia Domna. 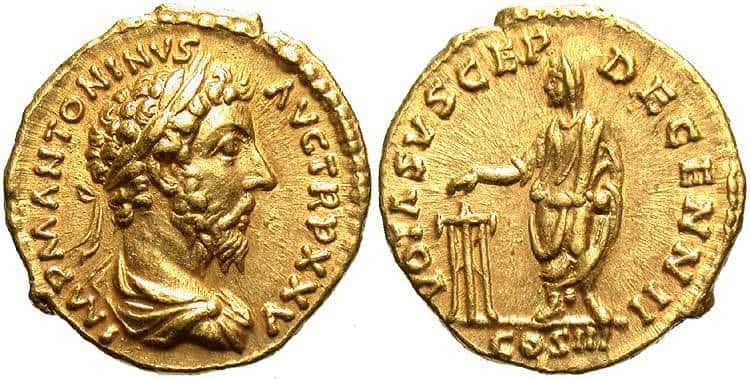 The gold aureus of Marcus Aurelius’s coinage corresponded to 25 silver denarii, namely, this amount was paid as a monthly salary to Roman legionnaires. Prices for ordinary good quality woolen and silk fabrics in 305 n. e. ranged from 16 numumies and 10 aureus per pound, respectively, and the cost of richly dyed silk fabrics with gold threads reached 125 aureus per pound, which is three times more expensive than the weight of gold. Obviously, such fabrics were intended for the emperor and his suite to be sewn. 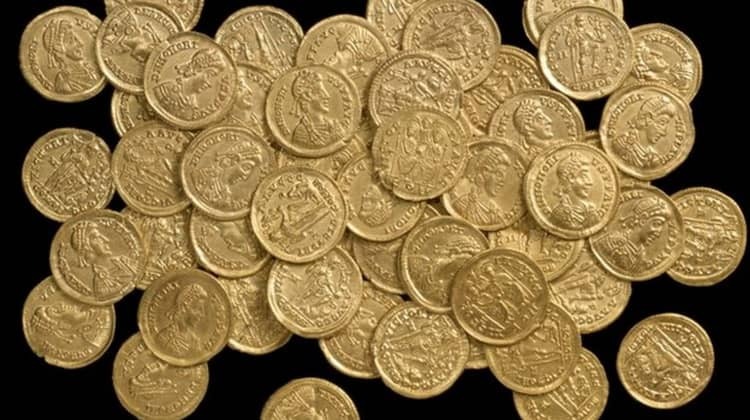 For 1 golden aureus in the period of the Roman Empire, you could buy 400 liters of cheap wine or 91 kg of flour. This price level existed until 300 AD. 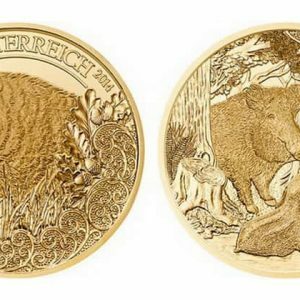 e. The supply of gold from Spain and Eastern Europe has not decreased, which led to the introduction of a new gold currency − solid. In 23 BC. e. Emperor Augustus equated 25 denarii to one golden aureus. 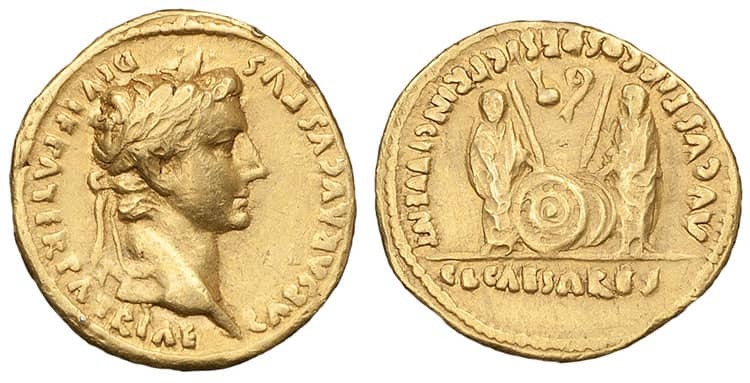 It is worth noting that for the first time the gold aurei minted Caesar in 40 BC. e., their weight was 8 g., and during the reign of Emperor Nero, he began to weigh only 7.2 g. Based on this, the denarius weighed about 0.32 g of gold, for which it was possible to buy 1 kilogram of bread.